Swimming is an excellent way to stay fit. Not only does it place less stress on the body’s joints than running or other forms of aerobic exercise, it also provides a full body workout that helps reduce stress and boost one’s overall sense of well-being. Plus, you don’t have to worry about getting sweaty in the water! The following swimming workouts are compact enough they can be carried out during your lunch hour at a pool near you. Before starting any of these swimming workouts, make sure to include a few warm-up and cool-down laps in the strokes of your choosing. The first lunch time swimming workout is a perfect introduction or quick refresher course in the basic strokes. To begin, swim 500 meters using your best freestyle. Use these laps as a warm-up to the workout. Once you’ve completed the 500 meters of freestyle, swim 2 sets of 50 meters using the butterfly stroke, making sure to kick fast. Next, swim 3 sets of 150 meters in freestyle again. For the first set, pay attention to the beginning of each pull. For the second set, concentrate on the middle section of the pull, and for the third set focus on the hard push at the end of the pull. Next, swim 2 sets of 50 meters using the backstroke followed by 3 sets of 50 meters freestyle using the same style as mentioned above. This is followed by 2 sets of 50 meters in breaststroke, followed again by 3 sets of 50 meters of freestyle. Finally, swim 2 sets of 50 meters of freestyle as quickly as possible, followed by 3 sets of 50 meters of freestyle to cool down. 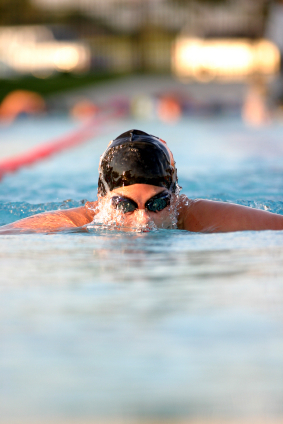 A fair swimmer should be able to complete this workout in 45 minutes. The next of the swimming workouts makes use of the pool’s supply of floatation devices and toys to focus on specific aspects of each stroke. To begin this workout, swim 400 meters in freestyle to warm-up. This is followed by a four stroke set known as the individual medley, where the swimmer swims 100 meters using the butterfly, 100 meters backstroke, 100 meters breaststroke and 100 meters freestyle, in that order. After the individual medley, swim 300 meters with a plastic buoy between your legs using an arm movement of your choosing. This is followed by a 4 x 75 meters set of individual medley. Next comes a 200 meter swim holding on to a plastic floatation device and using the kick of your choice, followed by a 4 x 50 meters set of individual medley. Afterwards, swim 100 meters using just arms or just legs coupled with the appropriate floatation device, whichever you prefer. Finally end the workout with a 4 by 25 meter set of individual medley swimming as hard as you can. A good swimmer should be able to complete this workout in 40 minutes compared to 60 minutes for an average swimmer. Don’t forget to cool down once the workout is completed!